Earlier this year we enjoyed 12 gloriously sunny days in Mexico’s Yucatan Peninsula. Our plan was to relax and unwind. However, the lure of adventure was simply too much to ignore. 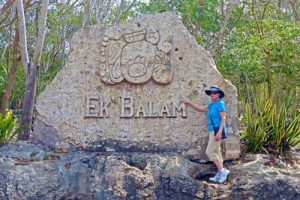 A tour to the archeological site known as Ek Balam (“Black Jaguar” in the Mayan language) followed by a visit to the Cenote Maya, the Yucatan’s biggest vaulted sinkhole, was enticement enough. Ek Balam was about an hour’s drive from our resort. En route, our guide, Irvine, told us that the Yucatan Peninsula was the ancestral home of the Maya. Our bus journeyed through predominantly flat terrain. Palm and kapok trees lined both sides of the highway. Irvine informed us that the native bedrock is porous limestone and that below the surface lies a fascinating subterranean world of underground rivers, caves and sacred water-filled cenotes. These deep natural wells were first formed when a giant asteroid crashed into the earth many millennia ago. Rising above the jungle canopy are the ruins of Mayan villages, temples and pyramids where god-like emperors once proudly ruled. 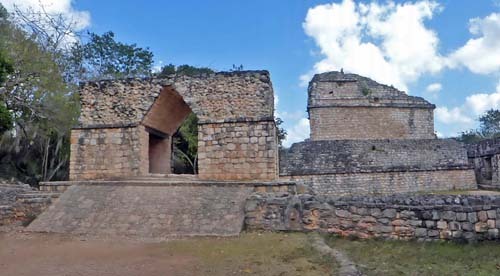 From Ek Balam’s parking lot we walked along a tree-shaded unpaved trail to the remains of the triple defensive walls that surround the heart of Ek Balam. From around 700 900 A.D. it was the thriving capital of the Kingdom of Talol. Over time the city became lost to the jungle. Much restoration, reconstruction and renovation of the site was carried out 20 years ago. Today the central portion covering about 1.5 sq. km. is open to the public. 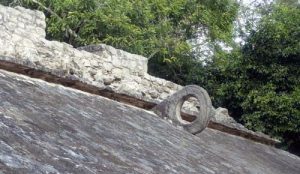 We followed Irvine up the steep ramp to the main gate capped by a typical triangular shaped Maya arch until we came to the Oval Palace. Its large limestone blocks were cemented together by heating crushed limestone with sap from the rubber tree to form a kind of stucco. Lastly the Mayan workers covered the temple with red and blue coloured plaster. The seeds of the achiote plant or ladybugs were the basis for the red dye. The source of the blue dye came from aňil or the wild indigo plant. Using our imagination, the structure sprang vividly to life. In the city’s heyday between 200 and 500 elite citizens lived within its defensive walls while about 5,000 commoners resided beyond their protection. 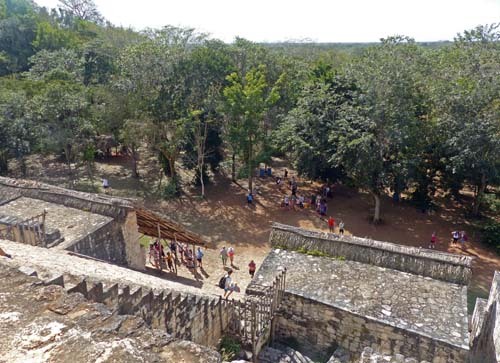 Today, tourists wander the grounds at leisure intent on learning about the history of this ancient civilization. Next we came to the ball court. The ceremonial game played here was a highlight of Mayan life. In the centre of the rectangular arena is a long narrow playing field. On either side rise sloping walls. At the top were viewing platforms for the nobility. At the midpoint on each side, a large hollow stone circle was positioned several metres above the ground. Irvine explained that each team comprised 2-5 warriors and that the game had its origins in Mayan mythology. The objective was for the players to propel a hard rubber soccer-sized ball weighing some eight pounds through the stone hoop without the using their hands or feet. Only the upper arms, thighs or hips were used to keep the ball in motion. The victorious team was the first to score a goal. As a reward, the winning team’s captain was sacrificed. This was deemed an honour. 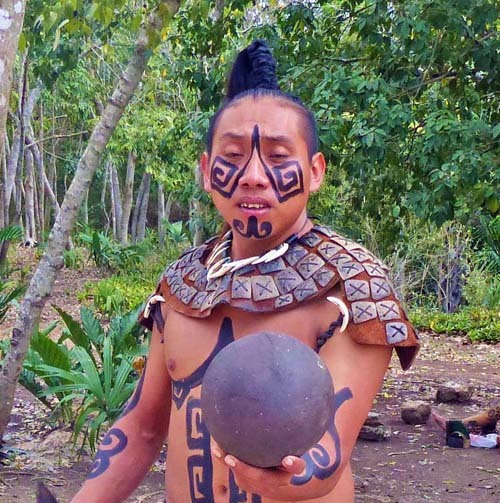 Later, we encountered a Mayan warrior suitably attired and ready to play. A little further on we came to the most interesting and largest building: the Acropolis which rises 96 ft. skyward. It has six levels and so far 72 rooms have been discovered, one of which houses the ruler’s tomb. A steep stairway of uneven stones leads to the topmost level. I couldn’t resist the upward journey but paused halfway up to catch my breath. Here at the Snakemouth Gate, a thatched roof protects a stucco fresco which features a winged creature as well as carved images of the jaguar’s claws and several statues. The views across the treetops even from this height were spectacular. I didn’t go any higher but descended gingerly backwards one step at a time. This amazing temple demonstrated the king’s supreme power. From its top, he could watch the movement of the sun along the horizon and even predict the coming rains. A short bus ride brought us to the Cenote Maya. To the Mayan people, these sacred wells were holy and in days gone by were used as places of sacrifice. They were thought of as entrances to the underworld, the home of the gods. In fact, these deep water-filled sinkholes often led to underground streams and still provide the local area’s drinking water. 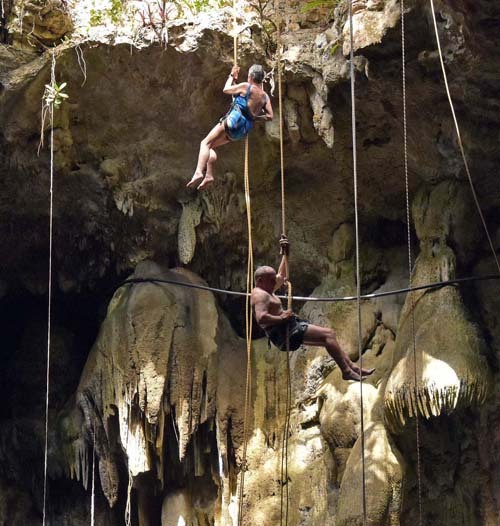 The plan was to rappel down 96 ft. into this cenote. But first of all, we attended a traditional cleansing ceremony. Ten of us gathered around a small altar depicting the three levels of the Mayan world … the upperworld, the middle world and the underworld. It was decorated with sacred plumeria flowers and a small wooden cross. We were greeted (Ma’alob k’iin meaning Good Morning) by a Mayan shaman attired all in white. He waved a small chalice of smoking copal incense in front of each person while chanting a blessing in the Mayan language. Clouds of wood-scented smoke dissipated into the air burning away any negative energy. Our ritual purification complete, we thanked the High Priest before going to change into our swimwear. In order to remove any sunscreen or other oils, we were directed to an outdoor shower. It was rustically built. The water flowed across a wooden gutter suspended about six feet above the ground. I pulled a handle and a gush of cold water descended on me. 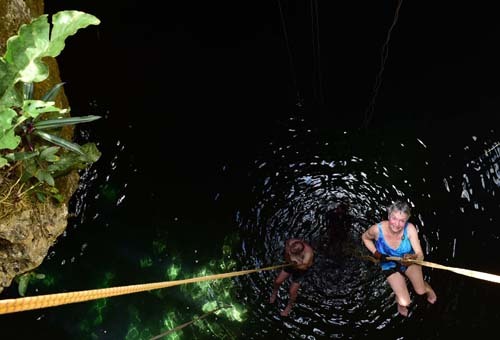 Following Irvine once again, we approached the launching platform suspended 26 metres above the Cenote Maya. I felt apprehensive. Luckily there was little time to think. On went the safety harness. Irvine secured it and gave me words of encouragement. A father and daughter were the first team to leap into the void. My husband and I were next. We donned some protective gloves. Irvine instructed us to lean back, straighten our legs and keep them at shoulder width while he kept tension in the ropes. My right hand was at my hip to release tension and my left hand was on the rope in front of me. I’m really nervous. In accordance with Irvine’s instructions, I tentatively descend down three steps, bend my knees and cross my ankles. I daren’t look down to the still, black water below. The sun’s rays light up the limestone formations. Then I drop down … slowly … slowly … and then a little faster as I gain courage. At last my toes dip into the cool water of the cenote. Here another guide unbuckled me and I sank into a huge black rubber ring and swam to the landing platform. Phew! I did it! I was so proud of myself! Other tourists are already having fun splashing into the water from the zip and slack lines strung across the cave. We climbed back up the steep walkway and changed into our day clothes. Of course, we’d all worked up a good hunger and enjoyed a late lunch of chicken mole, rice, zucchini, scrambled eggs and potato turnovers. That was more than enough excitement for one day. Tomorrow will be a day of relaxation and renewal.